Though my marathon training didn’t officially begin until the Fourth of July, it began for me three days after Josh died, when CHRC Cardinal of Community Connection, Aliza got me out for a morning run. We ran through Prospect Park and light poured through the trees, which hadn’t yet shed their leaves. That beauty felt profound. Then an older man biking in front of us fell. He wasn’t badly hurt, just shaken and bruised. Aliza and I held his hands, helped him up, and waited with him for an ambulance. His name was Ted Erhardt, a dance therapist who worked with psychiatric patients. He described how movement can shift things locked inside these patients when language fails. When I got home, I watched this lecture he gave. In it, he talks about a young woman so depressed that she would reach for something and fall into a catatonic state, frozen for a half hour in that bent position. They did a group therapy session where other patients mirrored her frozen state until she felt held and could shift out of it. Then Ted asked, “What are we reaching for?” One patient said, “Home.” The young woman shifted out of her frozen state and reached for the hands of the patients beside her. 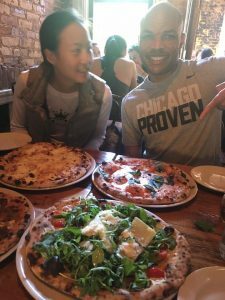 That story is emblematic of what training for and running the marathon with the Crown Heights Running Club meant to me. Being a writer means liking the company of your own mind. But in the weeks after Josh died, I wasn’t able to work on my novel and I wasn’t doing well alone. Mine wasn’t a flat-line grieving: I had a heightened sense of the connective threads between all human beings, an awareness which Josh created, even in his dying days, that our lives are most beautiful in relation to one another. 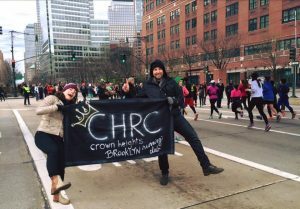 While I wasn’t yet comfortable with solitude, connections to friends, family, strangers, and the singular CHRC Royals felt incredibly healing. CHRC was a community that was exceptionally present for me in those days. Not just on runs; there were friendsgivings, birthdays, ice skating ventures, royal courts, holiday parties, calls, texts, brunches, and dinners. I’ve never been in another running club, so I have no means of comparison. But I’ve found the Royals to be people uniquely reflective about not just how to move forward as individuals, but how to carry the people around them forward. Liz and Nate, two Royals dear to my heart, have poked gentle fun at me for managing to get into a “deep conversation” with someone on every single long run. That’s true, but in my defense, it doesn’t take much to get these conversations rolling. A few questions. A curious ear. When you ask a Royal a question, they answer thoughtfully and openly. They listen with that same openness and reflection. So I’d find myself in conversations about job, relationship, and geographic changes; art, politics, religion, and love. Punctuated by lots of laughter. That’s how I worked my way up not just to 22 miles, but to publishing an essay about Josh, finishing a draft of my novel, dating again, and running toward a future as large as what I had run through: In the “caboose group”, at a comfortable conversational pace, covering miles physical and metaphysical. Given that Type A attention to details has never been my strong-suit, all of the CHRC marathon-prep sessions were helpful. Still, I left the final prep session feeling a little overwhelmed by all of the information. I devoted a day to ticking things off a marathon To Do list. There was a good chance it would rain and my greatest fear was being cold and wet. Royals in the know recommended wearing a garbage bag that you could throw away before the race started. In the midst of my To Do List multitasking the Friday before the marathon, I tried on a kitchen-size garbage bag over my sweatshirt to see whether it would suffice or whether I needed to buy the 33-gallon size. It was so comfortable that I forgot I was wearing it. I checked my mail and took my trash out in this garbage-bag poncho. After sorting the recycling, I discovered that the door of the recycling room, through some malfunction, had locked. There I was, midday in my building, locked in the recycling room, wearing a garbage bag. I didn’t have my phone with me, so I banged on the door and shouted, “Help!” until the only neighbor not at work came to my rescue. She found the super, who unlocked the door. Thankfully, I enjoyed enough solitary time in the recycling room to remember to take my garbage bag poncho off before I was rescued. Liz and I had a good laugh over this. Being a master of all the details that I am not, Liz also figured out that my best running buddy pace-wise and start-time-wise for the marathon was the brilliantly steady pacer Sebastian. 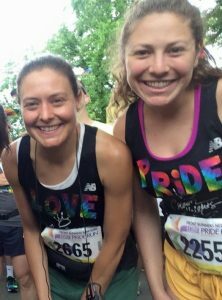 Written by Brooke Shaffner – one of our dear members of Running Royalty and former Marathon Water Wench.